Here’s a wonderful creation using stunning papers from Paper Temptressand a beautiful stamp from artist Rebecca Sinz of Sweet Pea stamps called “Sweet Demons.”Â I used some amazing textured papers along with some stunning stitched paisley. 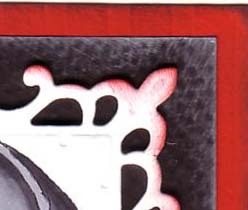 The base of the card uses beautiful paper calledÂ Red Pepper Thick columns. I highlighted this paper by adding some chalking to the edges. The base of the card is covered in some wonderful stitched paisley ribbon. I got this awesome ribbon when visiting Istanbul this summer. There is literally a “ribbon district” that contains store after store after store of places that sell nothing but ribbons and laces. It’s amazing. A real crafter’s dream. I added the saying “Have a magical day” to the card because it goes so well with this image. Now don’t you want to take some delicious paper, amazing ribbon, and a fabulous stamp, a killer die cut and make a card like this?Â Who wouldn’t want to hand out a beautifulÂ set of handmadeÂ cards to people as Christmas gifts? 2 comments to Have a Magical Day! OMGOSH!!! LOVE LOVE LOVE THIS CARD! that stamp is sooooo cool!!!! Love all the texture the paper gave you. Also just love the die.